Polly Lane lost almost everything. The long journey west on the Oregon Trail took her mother and her father, left buried out in the wilderness. 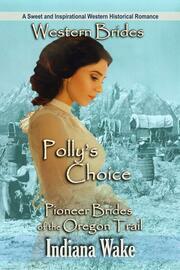 Then her new found, and only true love, Travis Hurst, left to head onto California and the gold mines. “I’ll be back for you as soon as I can.” When as soon as I can, had reached ten months, Polly knew he wasn’t coming back. Gavin Swain, saw her sat on a straw bail at the local dance, and he knew he never needed to look at another woman as long as he lived. However, after finding out her heart was promised to another, he decided to just be friends, even though he wanted more. After the return of the promised one, Travis Hurst, Gavin figured his love was lost until he found something wasn’t quite right about Travis. Now with the news of the cad in hand, how could he possibly tell? Gavin wanted to be first choice, not the fall back choice. Now she’s leaving with Travis, it looks like he was neither. Will Polly find out in time about Travis the cad? Or will she leave, only to find out later the mistake she’s made? Find out in Indiana Wake’s new, sweet, clean, inspirational western romance.